You scored as John Calvin, Much of what is now called Calvinism had more to do with his followers than Calvin himself, and so you may or may not be committed to TULIP, though God’s sovereignty is all important. I came across the book almost purely by accident. Dr. Haykin and I had headed to the Anglican Book Centre in Toronto and I had found a couple of deals. On my way out, I saw this hiding on the new arrival section. I saw the name, Robert Clouse, who of course I was quite familiar as the editor of The Meaning of the Millennium and a contributor to Two Kingdoms: The Church and Culture Through the Ages. I picked it up and saw the recommendations by Edwin Yamauchi, Donald Campbell and Homer Kent. At this point I knew I had found something quite good. Dr. Haykin was right. It was serendipitous. This book fills a huge gap in historical theological scholarship. The meaning of the millennium has of course been an incredible debate since the apostles themselves when they asked, “Lord, will you at this time restore the kingdom to Israel” (Acts 1:6)? It even goes back further as to when God would establish his eternal kingdom. What is the nature of the millennium (Rev 20)? Is it earthly? Is it spiritual? When will Christ comes back in relation to the millennium? Before? After? These questions have raged for millennia themselves. What Clouse has done is sift through primary source material from the very early Church fathers to today and collate for us their writings on the millennium and the end times. Throughout he also offers annotated notes to the various writers and writings. First, he deals with biblical foundations related to eschatology. He discusses issues of the rapture, the seventy weeks of Daniel, the tribulation, Armageddon, the millennium, and the final judgment. From there, he begins in the Church Fathers. He includes material from Papias, Irenaeus, Justin Martyr, Tertullian, Hippolytus, Commodianus, Lactantius, and Origen. He then moves into an extensive section on Augustine. He then moves into the Medieval and Reformation period with the Anabaptists, John Calvin, Martin Luther, Guy de Bray, and the English Congregational Church. From there he moves to the 17th century revival of premillennialism in Johann Alsted, Joseph Mede, John Archer, John Rogers, and Anna Trapnel. Then he proceeds to 18th century postmillennialism with Daniel Whitby and Jonathan Edwards. He goes from there to 19th century dispensationalism with John N. Darby, William E. Blackstone, and Dwight L. Moody. Then he moves to 20th century developments with C. I. Scofield, William S. McBirnie, Christabel Pankhurst, and Leonard Sale-Harrison. Finally, in the 21st century he looks at Hal Lindsey and Tim LaHaye and Jerry Jenkins. 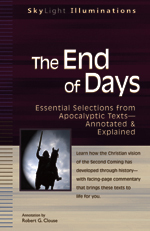 He finally includes helpful reading to which students of eschatology can move on. I have only briefed it but I find it overall very good. Clouse’s comments are excellent and judicious and do not try to bias the reader into one position over another. I have some small qualms, but they are quite small. This book is incredibly helpful. Even the introduction is worth the price of the book where Clouse simply gives us the flow of eschatological thought throughout Church History. Clouse is truly a historian who can and should be emulated. If I were to teach a class on eschatology, this would be a required book. It is so important to have an understanding of the history of a doctrine in the life of the Church; especially on such a divisive doctrine as eschatology. This book cannot be recommended any higher! Go out and get yourself a copy today! You can find it here. You are currently browsing the Working out Salvation with Fear and Trembling blog archives for May, 2007.